Clontarf Slideshow, Part 1, 1940s - 1970s, courtesy of Christian Brothers Institution Albums 1 & 2 (Holy Spirit Collection). Clontarf was established in Manning by the Christian Brothers from 1901, with boys from the Subiaco Boys' Orphanage as the first residents. Clontarf later took in boys aged around 12 to 16 years from various backgrounds including Australian-born boys who were wards of the State and those who had been admitted privately, orphans, and (from 1947 to 1966) child migrants from Britain and Malta. Clontarf closed in 1983 and the site later became the Clontarf Aboriginal College. The Christian Brothers moved to a site along the Canning River in what was later known as the suburb of Manning, in 1901. The foundation stone for Clontarf was laid on 3 January 1901. 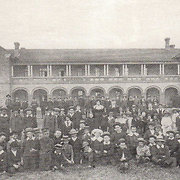 The Christian Brothers had previously been running the Subiaco Boys' Orphanage and the first residents of Clontarf were the boys and brothers from the Subiaco Boys' Orphanage. When Clontarf opened in 1901, it was known to the child welfare authorities as the Clontarf Orphanage Industrial School for Junior Roman Catholic Boys, near Victoria Park. By the end of that year, there were 70 boys on government subsidy living at Clontarf, aged younger than 6 years to over 12 years. 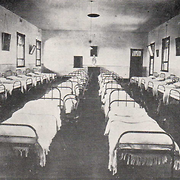 Possibly, there were also boys who had been admitted privately. By 1907, there were 78 boys subsidised by the government, of whom 52 boys were under 12 years and 26 over 12 years old. In 1918, there were 116 'Government children' and 53 'private children'. From statistics that are available from government reports and research conducted by Barry Coldrey (The Scheme 1993), it seems that Clontarf accommodated around 100-150 boys until after World War II, when child migrants were sent to Clontarf. 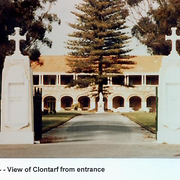 During the time that boys who were sent from Britain and Malta lived at Clontarf, up to 280 boys could be accommodated there. In the 1960s, Clontarf housed around 150 boys and in the 1970s the number of boys fell to 60 or fewer. Some boys stayed at Clontarf for short periods, while others remained there for years at a time. From 1962, the number of boys who were privately placed exceeded the number of boys who were wards of the State. The Christian Brothers' institutions Bindoon, Clontarf, Castledare and Tardun first received widespread publicity about child abuse in the early 1990s. In 1993, the Christian Brothers in Western Australia issued an apology and from 1995 have funded independent services to help with family tracing, counselling and remedial education for men who had suffered in their institutions. Many former residents of these institutions have shared their experiences and memories (bad and good) at government inquiries, in books and in oral histories. Many of these recollections relate to the post-World War II period, but earlier incidents of abuse have been cited. For example, Coldrey reported (1993, pp.32, 34) that a gardener was dismissed in 1915 for 'immorality with some of the boys' and in 1918 boys reported sexual assaults by a Christian Brother, who was convicted. When Clontarf was established in 1901, there was no electricity. Coldrey writes (p.30) that electric lights were installed and operated for the first time in August 1905. In 1906, toilets, urinals and septic tanks were installed and an inspection by the Health Department in 1917 (p.32) led to other improvements in facilities. 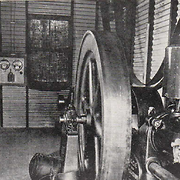 Hot water showers were installed by 1927 (p.42). It was common for all institutions to try and raise their public profile and to encourage donations from the public. In 1918 the Clontarf Brass Band was established, reportedly (Coldrey, p.33) due to funding from the Catholic Archbishop of Perth. The Clontarf boys' bands featured regularly on the Perth social scene thereafter. Around 1919, a manual trades workshop was built at Clontarf. Half of this space was set aside for carpentry and the remainder was a bootmaker's workshop. The sale of goods, on which the boys worked, was a source of income for the institution. A road from Clontarf to Albany Highway, paid for jointly by government and public donations, was officially opened on 10 April 1927. This gave Clontarf a much better access to the city and other parts of Perth. Between 1926 and 1946, government reports give the number of boys who were placed 'at service'. Boys could be sent to work with employers in a variety of trades, or to farms as labourers. Some boys would have stayed at Clontarf, or worked in the other Christian Brothers institutions. Formal 'service agreements' were lodged with child welfare authorities. 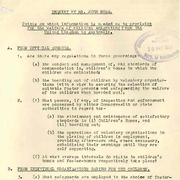 Coldrey (p.43) writes that the Child Welfare Department had been dissatisfied with the administration of service agreements at Clontarf during the inter-war years. Apparently, there were a number of 'handshake' agreements, and while some employers 'did the right thing by the orphanage lads' and paid their wages diligently, other employers 'were remiss' and some employers were 'hard and exploitative towards the boys'. Government reports (Signposts 2004, pp.163-165) in some years show 'abscondings' or the number of children who ran away. Coldrey (pp.39-41, 45, 462) writes that Br Paul Keaney, who is usually associated with Bindoon, also worked at Clontarf, possibly beginning in the role of Director in 1927. Keaney had a background in the Irish Constabulary and the Queensland Police Force before joining the Christian Brothers in 1915. Keaney had worked at St Vincent's Boys' Home in South Melbourne in 1918 and came to Clontarf in 1919. In 1929, Keaney moved to the wheatbelt parish of Mullewa to help establish the Tardun Farm School. In 1930 (p.95), Keaney was transferred from Tardun to the Christian Brother College, Fremantle (a day-school). By 1936, Keaney was again the 'Superior' at Clontarf and Coldrey (p.49) says that during the 1939-1941 period 'Keaney's relations with the Child Welfare soured because of his casual attitude to rules and regulations (other than those of his own making) and his excessive punishment of certain inmates which resulted in a long-running dispute with the department'. In 1941, Keaney apparently had what Coldrey (p.50) describes as the 'first of his nervous breakdowns'. A new dormitory was opened on 8 September 1935 and in 1937 there were what Coldrey described (p.48) as major refurbishments, including painting and refurnishing areas including the boys' dormitories. Between 1940 and 1941, a chapel was constructed by the boys at Clontarf, under what Coldrey (p.50) described as an 'apprenticeship scheme' where 'little boys, many of whom are in their bare feet' laboured on the task. Br Keaney was Superior of Clontarf during this period. The chapel was consecrated.on 20 December 1941 and during the ceremony the catholic Archbishop of Perth announced that Clontarf would thereafter be known as 'Clontarf Boys' Town' resulting in what Coldrey (p.140) described as 'tumultuous and prolonged applause' from an audience who 'had all seen the Spencer Tracy movie' of a similar name. This account suggests that there was an element of sentimentality that influenced public perceptions of children's homes in that era. Coldrey (p.51) has described the period up to World War II at Clontarf at being on the one hand, an environment where boys could enjoy freedoms of living in a bush environment along the river-banks, a place where they could go swimming and enjoy a lot of recreational activities as well as gaining schooling and work-related skills. On the other hand, he describes an 'underside' where the 'manual work could be too hard', the 'sunny days could become the scorching heat of mid-summer which could make the toll even harder'; the 'no-nonsense discipline could weigh heavily' on boys who were 'rebellious' or just behaving as adolescent boys do. 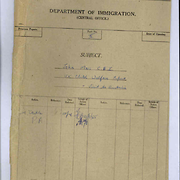 Incidents of severe punishments were related in Coldrey's book and have been verified by men who were residents at Clontarf in submissions to government Inquiries and in oral histories. Clontarf was requisitioned by the defence forces with 'unseemly haste' in 1942 according to Coldrey (p.141), and the boys were evacuated to either Tardun (school-age boys) or Bindoon (boys over 14 years of age) on 1 March 1942. It seems (Coldrey, pp.141-143) that the boys and staff returned to Clontarf in February 1945 and that a difficult period of readjustment followed. In 1943 the Clontarf authorities became aware of what Coldrey (p.143) described as 'unpleasant sexual habits', and other deprivations including a lack of clothing and inadequate facilities and numbers of staff to look after an increasing number of boys. However, there were also some positive initiatives to report. 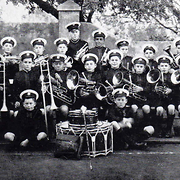 The Clontarf Brass Band was re-established in March 1945 and the public again rallied to support Clontarf and other children's homes with a 'Children's Victory Celebration' at the Cannington showgrounds in December of that year and other donations were received to purchase essentials. 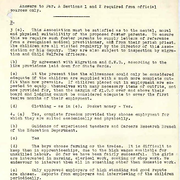 In early 1947, Clontarf was inspected by child welfare authorities with a view to admitting child migrants from Britain. The inspection report is quoted in part by Coldrey (pp.146-147) and shows that Clontarf was poorly fitted out in almost every aspect. Diningroom, kitchen, dormitories, laundry, bathroom, classrooms, gymnasium and library were substandard. As the church was keen to be involved in child migration, the Archbishop made a large donation to improve the condition of facilities at Clontarf. In 1947, Clontaf's ranks were swelled by the admission of boys who had been sent from Britain as unaccompanied child migrants. Coldrey reports (p.149) that there were 191 boys in September 1947, including 47 British child migrants. By 1953, the Child Welfare Department (Signposts 2004, pp.164-166) reported that Clontarf could accommodate 280 boys and until 1967, the number of boys at Clontarf rarely fell below 150. Boys were expected to work at Clontarf, and this included collecting wood. In October 1950, this had a serious outcome when 19 boys were involved in a truck roll-over in the Collier pine plantation in Como. The West Australian newspaper reported (6 October 1950, p.2) that seventeen boys were hospitalised. In evidence to the Inquiry into Children in Institutional Care, later known as the 'Forgotten Australians' inquiry, a man described (Forgotten Australians 2004, p.42), a life in Clontarf that has left a deep impression on him: 'In 1954, aged 11, I was sent to Clontarf Boys Town…where Hell continued for the rest of my childhood'. Published, official, reports generally present a brighter picture. The annual report of the Child Welfare Department (Signposts 2004, p.165) described some of the facilities at Clontarf: 'A new Science Laboratory is being provided and, too, a trade training centre, containing most modern and varied equipment, is used to provide technical training. Dormitories have been repainted in attractive pastel colourings and renovations to the large recreation hall are under way. New hand-ball courts are nearing completion and thus another outdoor activity can be added to the boys' recreational activities'. On 15 December 1955 (Coldrey, pp.157-159), fifty three boys were being transported to families in the south-west to be boarded out for the Christmas holidays. On the way, the bus collided with a truck on a narrow bridge at Mundijong. This serious incident resulted in the death of 11-year-old Michael Bowman, with three other boys having either one or both legs amputated in the crash. Nineteen boys had physical injuries that required hospitalisation and ongoing treatment and it is likely that the crash left a lasting psychological impact on many of the survivors. Michael Bowman's short life and the cause of his death are memorialised in the Michael Bowman Park in Serpentine where annual gatherings are held. After 1970, the child welfare authorities stopped reporting on the number of boys at Clontarf who were child migrants. 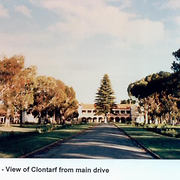 By 1975, Clontarf provided short or long-term accommodation for 59 boys in the 12-15 age group, with another 50 attending school daily on the Clontarf campus. 1982, government reports (Signposts 2004, p.167) show that Clontarf was no longer providing a 'full "substitute care" program' and in December 1983 it closed. The site was later used for the Clontarf Aboriginal College, which remained open in 2014. The Clontarf Old Boys Heritage Committee continued to be active in 2014, preserving the history of the site's period as a Home for boys. A Heritage Trail was opened in September 2012, the Clock Tower has been refurbished, and the Memorial Hall at Clontarf has had Br Keaney's name removed. Ross Fact-Finding Mission [British child migration] was interested in the welfare of British child migrants sent to Clontarf. Clontarf was classed as an orphanage within the meaning of the State Children Act 1907. Bindoon (1936-1966) was established with one Christian Brother and two older boys from Clontarf. Some boys were returned to Clontarf in October 1941, when Bindoon began to admit boys who were wards of the State. Boys from Clontarf were also sent to Bindoon during its first years as labourers on the early buildings. Boys often went to Clontarf from Castledare. When Castledare Special School closed, seven of the resident boys were placed in Clontarf. The Catholic Episcopal Migration and Welfare Association [CEMWA] coordinated the placement of child migrants to Clontarf. It has been claimed in a history of Clontarf that the Catholic Family Welfare Bureau was a factor in a decline of country boarders and day students being enrolled at Clontarf. Father Hudson's Society was one of the Homes in Britain that sent child migrants to Clontarf. Some older boys from Clontarf were placed at Keaney House in North Perth after they started work. Sixteen boys from St Kevin's Industrial School were transferred to Clontarf when St Kevin's closed. In 1901 the Christian Brothers moved from the Subiaco Boys' Orphanage (1872 - 1901 to Clontarf. It was not unusual for boys to be transferred between Tardun Farm School and Clontarf. In 1942, boys were evacuated to Tardun from Clontarf, at the request of the defence forces. Sources used to compile this entry: 'The Daily News [Christmas Cheer Fund]', The Daily News, 2 December 1916, p. 10, http://nla.gov.au/nla.news-article81358001; 'A salutary sentence', Western Argus, 14 December 1920, p. 7, http://nla.gov.au/nla.news-article34241700; Chate, A.H; Graham, Bruce; Oakley, Glenda, Date it! : a Western Australian chronology to 1929, Friends of the Battye Library (Inc.), Northbridge, Western Australia, 1991; Coldrey, Barry M., The Scheme: the Christian Brothers and Childcare in Western Australia, Argyle-Pacific Pub., O'Connor, W.A., 1993. pp.25. 30, 32-34, 39-43, 45, 48-51, 95, 140-144, 146-147, 149, 157-159, 462.; Information Services, Department for Community Development, 'pp.162-168, Table 10: Young People at Clontarf, Certain Years between 1920 and 1983', Signposts: A Guide for Children and Young People in Care in WA from 1920, Government of Western Australia, 2004, http://signposts.cpfs.wa.gov.au/pdf/pdf.aspx; Parliament of Australia Senate, Forgotten Australians: A report on Australians who experienced institutional or out-of-home care as children, Senate Community Affairs References Committee, http://www.aph.gov.au/Parliamentary_Business/Committees/Senate/Community_Affairs/completed_inquiries/2004-07/inst_care/report/index.htm. p. 42.; Western Australia. 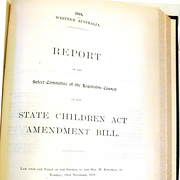 Charities Department, Report by the Superintendent of Public Charities and Inspector of Industrial and Reformatory Schools, Government Printer, Perth, [W.A. ], 1899-1907. 1902, 1903, 1904, 1905, 1906..